Activity time slots are the specific times that volunteers commit to for an activity. Time slots come in two forms: Blocks and Occurrences. Locate the activity you want to add a time slot to, select that activity and click the “Edit” button. Go to the Activity Time Slots tab and click the “New” button. Give the time slot a Title. You can add an additional bit of information in the title that can help volunteers identify what they must accomplish during the time slot they volunteer for. Select the type of time slot you need: Blocks or Occurrences. See description above for further information about this distinction. Once you select the type of time slot you need, follow the corresponding instructions for that type below. Enter a Time Description (optional). The description is currently for internal purposes only, it does not appear in the portal but it may in the future if needed. Enter the day block-signups open and close. Enter a total number of Needed Blocks for this volunteer activity. For example, if you need 20 hours of volunteer time for the activity and each block is 30 minutes long, then you should enter 40 in this field because you will need 40 blocks of 30 min to fulfill the 20 hours of volunteer time requested. Enter a time, in minutes, that each block should last. Provide a Minimum number of blocks that a volunteer who signs up for this activity must commit to. For most activities, you should enter "1" in this field, that means that if they sign up for this activity, they must commit to at least one block of time. Provide a Maximum number of blocks that a volunteer who signs up for this activity can commit to. 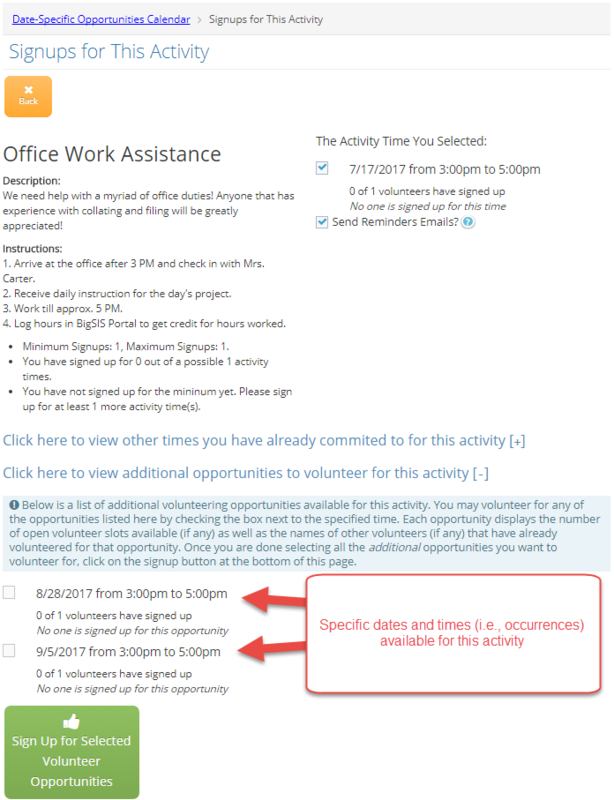 This is helpful when you want to limit the amount of time a volunteer can commit to an activity, especially if you prefer that multiple volunteers have the opportunity to sign up for this activity. Enter the Total number of volunteer signups needed per occurrence. This is the number of volunteers you need each time this activity occurs. Provide the Minimum number of occurrences a volunteer may commit to for this activity. If you have an activity such as “Weekend Daycare Supervisor” that happens every Saturday between 9AM and 12PM, if you enter “2” here, that means an individual volunteer who decides to sign up for this activity must commit to coming at least 2 Saturdays to supervise. Provide the Maximum number of occurrences a volunteer may commit to. Single Occurrence - use this type if you intend for this activity to be a one time only occurrence. Click “Save and Back” to save this activity time slot and return to the edit activity screen. Click “Save and Add Another” if you would like to save this activity time slot and add a new activity time slot to this activity.